What model/series of MIT speaker cables interconnects do you guys recommend? I'm done buying components & speakers and thought I would try something new wire wise. I use signalcable now and will probably be looking to buy used. The Shotgun series was the sweet spot, sound and price wise. The new offerings are unfortunately priced considerably higher. And then looked over everything thing else. At their asking price, I'm not sure how you could sit for a week afterwards. I'm sure they sound nice but I'm also sure they would experience 75% plus plus plus depreciation directly after purchase. Agree with f1nut, the shotgun series is very nice and can be found at a reasonable cost. What is that? a $90k external EQ box? Hardly. Plenty of info out there if you really care to know. Not the same model, but close. I'd say they are holding their value pretty well. We used the TOTL Oracle cables on the LSiM'S at the Capitol Audio Show. Pretty darn nice I have to say. The oracle series can be found at respectable prices. I would pay 3k for cables used, I just have a hard time seeing how an extra 90k could improve that much over a set that sold at say 10k. I am glad I got my AQ Meteor Bi-Wire 12 footers for 1400 used because there is no way I ever would have paid the 16k retail. And yes, AQ confirmed they are the real deal. My Shotguns are going nowhere, not sure why MIT did away with the other offerings, nor have I looked into it but they seemed to sell well when they had them..
^^^^^^Agreed; my rig has no other cabling other than Shotguns and I have zero desire to try any others. ^^^^^^Quite the impressive stack!! But how about the MH series Shotgun speaker wires.....where they be hidin at? I completely agree. But don't forget that the buyers of the top end cables are not usually budget constrained like many of us. That's why buying used higher end cables is your best bet. They lose value too quickly from full retail. Most anything in audio loses value quickly. So I've now collected pairs of MIT AVt1, Terminator 2 and Shotgun S3.3 speaker cables. Honestly, can't hear much difference between the AVt1 & T2's but the Shotguns have migrated to my main 1.2tl-based rig for sure. Will soon be building up another dreadnought as soon as Mr. FedEx pays my front door a visit with the transformer from the recent group buy. I've seen many use MIT cables for the IC runs minus the "box". Would like to give this a try on the new build and if it works, replace Belden 5T00UP 10awg runs on my other dreadnughts. - What cables are you guys using to do this? - Are you cutting up high $$ Shotguns to match the amp->speaker cables or will lesser versions make an audible impact? Several versions of Terminator wires on the market currently for a reasonable cost. Not sure I could bring myself to take wire cutters to Shotguns. - Are the wires physically different between the terminator series (T2 vs T5 for example) or are the grades tuned solely on the "boxes"? - How difficult to wire a cut cable into Speak-On's? Strands individually lacquered like OCC wire or can they be conventionally stripped? ^^^^I chopped up a pair of t4 bi-wires for use on my A1. Life would've been much easier for me if there wasn't 4 conductors and the thicker than normal cable. I had to hog out the end of the neutrik almost to the point of it losing it's structural strength. The 4 wires were also a pain to fudge into those connectors. But it was the last spot of my rig that didn't have MIT's so it had to be done. If you have a pair of regular 2 conductor cables I'm thinking it'll be a breeze. is there a list of hierarchy for their cables? Sounds like I need to seek out a set of Terminator "Full Range" cables. 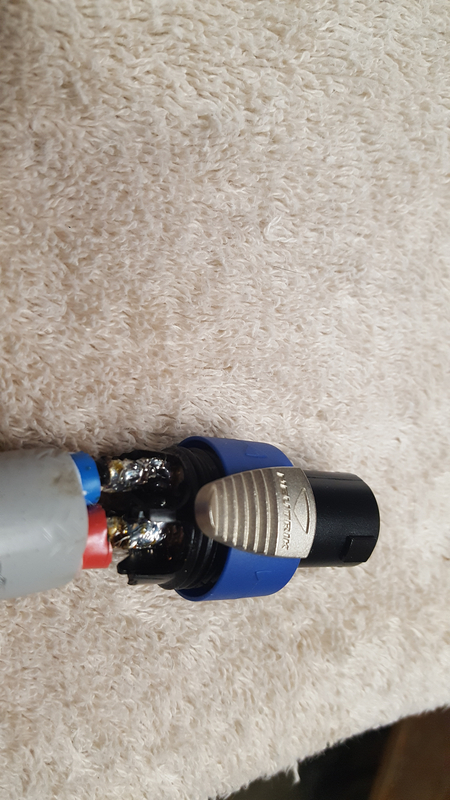 Those bi-wire versions have the OD of a good size garden hose so was wondering how to get it all shoved into the cap/strain relief or if you just ran the wires in minus the outer insulator. I was only able to squeeze the insulation a short ways and that's after hogging the hole out 3 sizes on a step drill. The techflex wouldn't go inside so I covered some of the neutrik with it. The good thing is it's done and I think it's a sonic upgrade over the basic wire I was using. All those little upgrades ad up. 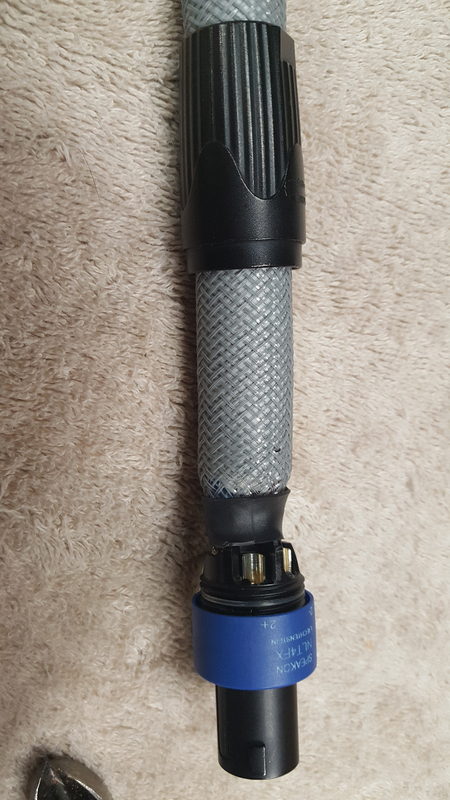 The T2 bi-wire uses the same cable as the Shotgun bi-wire. I have used both for the SDA cable. It takes some doing. Each run has two runs inside. Under the first layer is very fine angel hair wire, then under the second is solid core. You'll see what I mean. You have to be very careful cutting the insulation otherwise you'll cut into the angel hair. 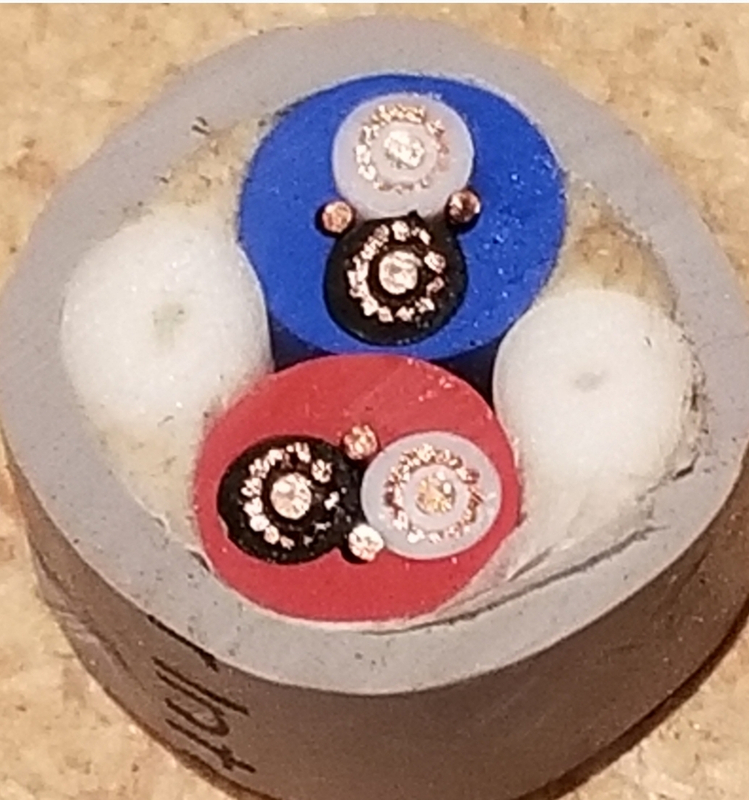 Once you get the wires exposed twist them together and solder to the SpeakOn tabs. You will need to remove the rubber bushing on the end bell, then the clamp that held it in. After that you can enlarge the ID of the end bell to 22mm or cut off the end of the end bell to obtain that diameter. You will need the 4 pole version, NLT4FX-BAG. Here's one I did using T2 bi-wire cable. I guess you boys are gonna shake your head at my $25k speaker cables on $7500 speakers at Axpona. Hell I use a $700 usb cable on a $500 streamer at the moment. Cables are a bigger player in the sound than many give them credit for. Gwh, good on you for searching. I tried a handful of MIT and they never did anything for me but I never got to the Shotgun level or higher. Jesse assured me that was where they got good even years ago. I did like the higher end Transparent cables I had but still defaulted to Wireworld. The Transparent left me feeling like the sharpness had been turned way down on a TV. Go with Jesse’s advice - Shotgun or better. 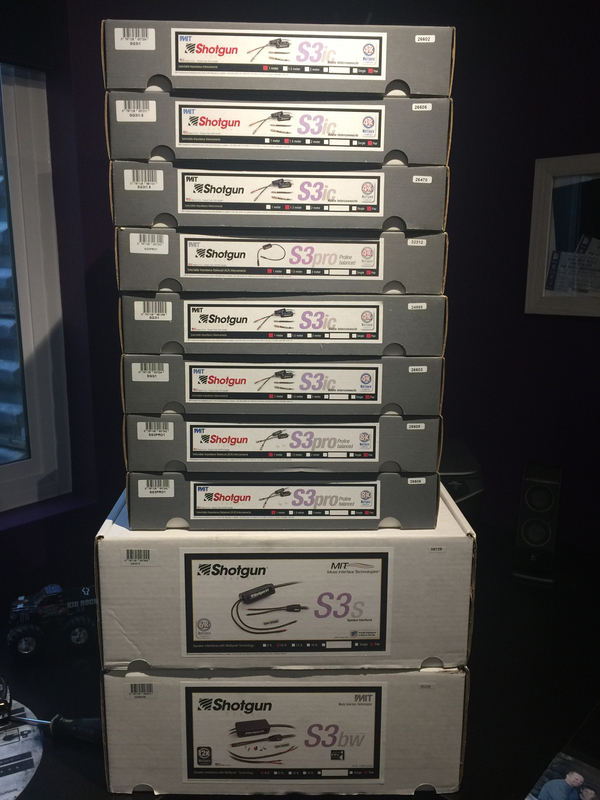 Not my intention to thread jump, but fwiw I’ll have a 20’ pair of EXP S2’s in the flea market soon. Nice cables, but buyer beware... these are your entry into yet another audio rabbit hole. @RobbyKY Here's a cutaway of those cables. With help from Jesse...big thanks, he saved me some grief when preparing them for the SpeakOn connectors. Definitely go slow, take your time, and cut carefully. For anyone making SDA cables from these, the two separate solid core wires in each run that you see in the pic are not used for this purpose. A bunch of guys snapped up the longer EXPS-2 cables that I sold recently to chop up for their dreadnaughts. The difference between my late model Terminator 2's and Shotgun's was HUGE (I/C's and speakers). Shotguns or better is where MIT starts to shine.